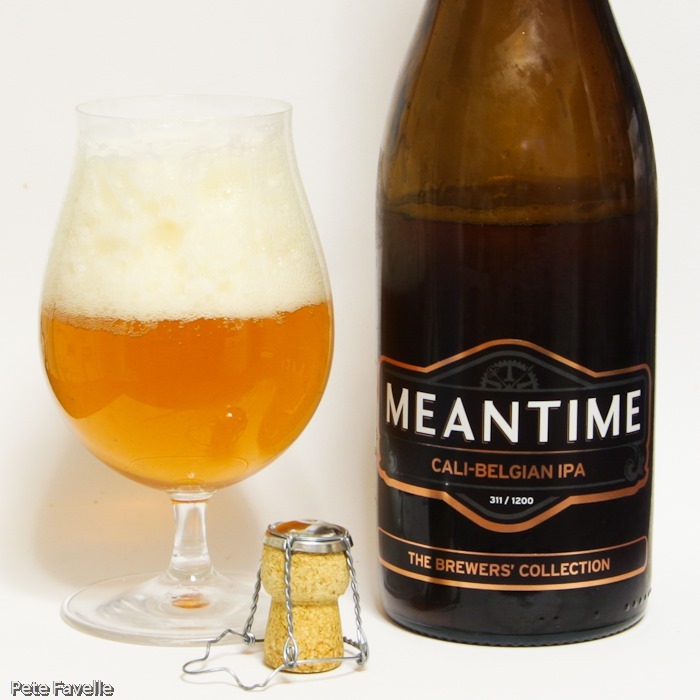 Meantime are a busy brewery, producing an impressively wide core range and a steady stream of special brews. Last year saw the arrival of the “Brewer’s Dozen” – a program of monthly specials exploring all manner of styles; I managed to try some of them, but they were generally draft only and my locals tend not to have much in the way of Meantime offerings. This year sees the arrival of a new range of monthly specials, the “Brewers’ Collection” and I’m happy to say that these are being produced in Meantime’s beautiful (and 750ml large!) Champagne-style bottles – which means that those of us not lucky enough to be able to find it on draft can enjoy it at home. The collection starts this month with a Cali-Belgian IPA, a 6.8% ABV fusion created by brewmaster Alastair Hook himself. As the name suggests, it aims to be a Californian style IPA brewed with Belgian yeast – but does it work? Refreshing for an IPA these days, it’s actually Pale; a nice light orange, with a deep, open textured and lingering white head. The nose is almost entirely Belgian; that classic spicy yeast aroma pretty much overwhelming any hops characteristic. In the mouth, the American hops come through much more obviously, bringing grapefruit flavours to blend intriguingly with the peppery finish of the Belgian yeast. The start has a hint of sweetness, but it’s subtle and soon gives way to a dry finish, helped along by a generously fizzy carbonation. Over time, the hops become more significant, leading to a nicely deep bitterness that starts to outweigh the Belgian side. So, overall it does what it says on the tin – the nose is more Belgian than anything else, but in the mouth it’s an impressive blending of the two styles. My only question is whether they should be blended – if I’m honest, I’m not convinced. Then again, it’s refreshing in today’s beer market to find something genuinely unusual that I haven’t tasted a thousand times before. Personally, I give this beer 3 stars – but that’s a very personal thing, because I’m much more of a Cali fan than a Belgian one. If you love both styles, I strongly suggest you seek this one out and I can’t wait to see what the following months will bring! 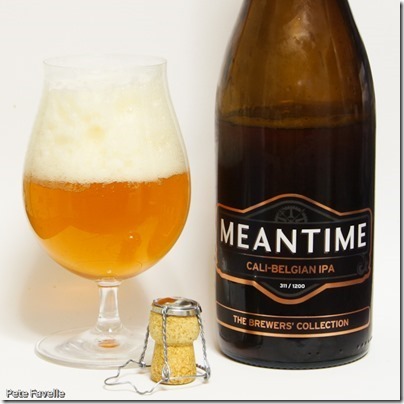 Many thanks to Meantime for providing this bottle to sample!